– This process of placenta encapsulation usually produces around 100-175 capsules, depending on the size of your placenta. – Capsules last many years when stored in the freezer. Take them for PMS, low milk supply, fertility challenges, and even menopause! – Capsules should be taken with a glass of juice and a meal to help the powder settle and reconstitute in your stomach. 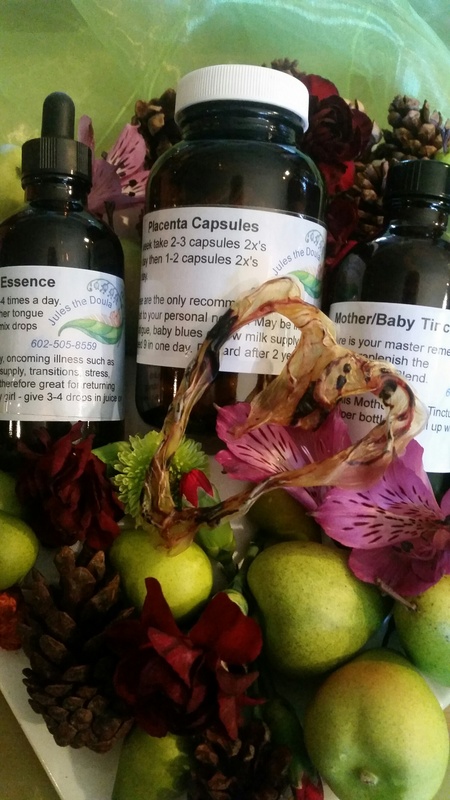 – Placenta tincture is an added bonus in that it can be used in addition to and long after the capsules are gone. By tincturing a small piece of the placenta in a high grade alcohol, you can prolong the benefits of your placental hormones. The tincture can be used in any time of trauma, transition, emotional distress and during menopause and ease your symptoms. – The tincture is allowed to sit for at least 6-8 weeks before use. Store in a cool, dark place and the tincture should last for many years. – Dosage is 7-10 drops of tincture in a full glass of juice. IMPORTANT: Once you have paid your deposit, please read through the client preparation page for instructions on how to prepare before your special day comes. Your payment with any major credit or debit card will be processed securely through PayPal. The remaining balance will be due when we receive the placenta. We are only able to provide pick-up and drop-off services to the Phoenix Metropolitan Area, Chandler, Tempe, Mesa, Scottsdale, Glendale, Peoria and Goodyear. If you live outside that area, you will need to arrange for transportation yourself. History of Placenta Encapsulation | What Is Placenta Encapsulation?